New Sony Instant Savings promotions are LIVE! In addition to the current round of Sony Instant Savings that went live on Sunday, BuyDIG is bundling a variety of useful free products as part of their Sony sale. Some cameras get a free Rokinon or Sigma lens, others get a free Tascam recorder, while the a7R II gets a 27″ LG display (!!!). You can find them all nicely organized in a grid over there. Another lens participating in the 20% off in-cart discounts is the Sony DT 55-200mm f4-5.6 SAM (SAL55200-2) dropping to $59 with free shipping. This is the international version of the lens, but used items don’t get warranty anyway. If you are not ready for some football, are you ready for some lenses? More specifically, Sony lenses? These lenses are part of the latest latest Sony Instant Savings. I am breaking them into three blocks, Prime, Zoom, and Converters/Adapters, sorted by price within each sub-group. I was planning an exhaustive list of all the lenses on sale, but I got exhausted along the way (ha! ), so not all lenses that are on sale are listed below. Zoom-zoom E-system fans! BuyDIG is offering for a limited time the factory reconditioned Sony 55-210mm F4.5-6.3 OSS lens (model SEL55210) in the black color scheme for $189 with free shipping and a 1-year extended warranty. We have a series of refurbished Sigma lenses offered at Adorama. We start with the refurbished 120-400mm f4.5-5.6 DG APO OS HSM AF for the Sony Alpha DSLR system going for $339 with free shipping and warranty. As the OS hints at, this is an optically stabilized lens. The new condition Sony 50mm f1.8 (E) lens, model SEL50F18, in the black color scheme, is currently on sale for a limited time for $209 with free shipping at Amazon by Amazon itself. Limit up to three per customer. 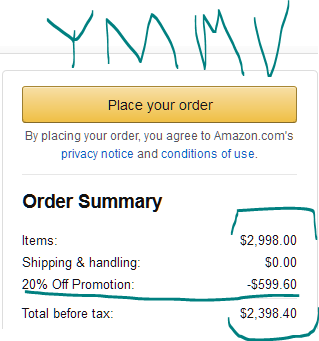 This is an old fashioned Amazon sale, not a lightning deal. There is no ticking clock on the offer, so expiration time/date is unknown. Prime time for Sony FE shooters, the new condition Sony 28mm f/2 FE lens is bundled with a handful of freebies at Adorama while still going for its standard authorized dealer price of $398 with free shipping: the Corel software bundle (five titles, including two photo and one video), a 49mm Digital Essential Filters Kit with case, a medium soft lens case, a lens wrap, and a cleaning kit. OPTIONALLY when you expand the yellow “Special Offer” section, you have the combined purchase option to add Elements 15 to your order for +$39 (Photoshop or Premiere) or you can add the bundle of the two for +$69. Hide your wallet behind a frame. A full frame! The Sony FE 16-35mm f/2.8 GM lens is now in-stock and ready to ship for its starting price of $2198 with free expedited shipping at B&H Photo. For more new arrivals, check the In-Stock Alerts category. Sunday is here and with it we have new manufacturer-initiated instant savings, including on this handful of Sony E-System Lenses and assorted accessories (flashes, battery grip, underwater case). A total of 25 products are participating in this promotion. Speaking of FE lenses, another one is now in-stock and ready to ship, it is the Sony FE 12-24mm f/4 G going for $1698 with free expedited shipping at B&H Photo. Keep in mind, estimates are only estimates and are subject to change as various factors known and unknown can affect their release and delivery. There’s also a few more pro-caliber accessories coming along with the a9, the Sony HVL-F45RM Compact, Radio-Controlled Gn 45 Camera Flash with 1″ Display for $400, and the Sony NPAMQZ1K Multi Battery Adaptor Kit also for $400. The release estimate for the a9 and accessories is May 25-26 in 2017. The 100-400 lens has a late July release estimate. As usual, there is a YMMV to the estimate, especially since these are flagship/pro gear that are not made in mass-market fashion. The new Sony 100mm f2.8 STF OSS Master Series (GM) lens is now in-stock and ready to ship for $1499 with free shipping by Beach Camera thru Amazon. It ships directly from Beach Camera and it is not Prime eligible. As of the time of writing, they have one left. Also coming along for the ride is the Sony HVL-F45RM Wireless Radio Flash for $400, with the same pre-order date as the two lenses above. These two have been added to the New Cameras and Lenses of 2017 reference page. If you are fond of E-system primes and extended lens warranties, Adorama is offering the new condition silver Sony 16mm f2.8 lens with a 5-year New Leaf extended warranty and a Vivitar 49mm filter for $223 with free shipping. This is among their Better Than Chocolate sales. On the other hand, if you don’t like extended warranties, you can get the lens for the same price but with 4% promotional rewards (instead of the other extras) at B&H Photo, among their latest Featured Sales. Likewise, Adorama is bundling a $50 Adorama gift certificate with the silver Sony a6000 body only while still selling it at the authorized dealer price of $398. For more action at Adorama, check their Pre-New-Year sale and their Year-Ending Rebate close-outs. The Sony Sonnar T* FE 55mm F1.8 ZA E-mount lens goes for $1000 at authorized dealers which are bundling it with various freebies, including a $50 gift card at Adorama, but if you are comfortable with imported grey-market items that come with a 1-year warranty from the seller (not from Sony USA), to the eBay Deals we go where eBay seller “Electronics Valley” (99.7%, New Jersey) is offering new condition grey-market imported Sony Zeiss Sonnar T 55 mm F/1.8 ZA FE Lenses for $700 with free shipping with a limit of five units per customer. The usual grey-market trade-offs apply. The current iteration of the Sony Instant Savings featuring Mirrorless and SLR lenses along with system accessories (flashes, grips, etc) is set to expire on October 1st, 2016. You can see the current choices nicely organized at B&H Photo. 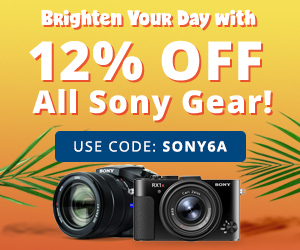 A new round of Sony Alpha Lens and Accessories Instant Savings promotion is happening at Adorama, with over 40 items participating, including a variety of Sony lenses (a mix of primes and zooms), lens converters and mount adapters, Sony-branded accessories (battery grips, flashes, mics, etc), and such. A number of them (but not all) are also bundled with a variety of free accessories! This Sony-initiated round ends on 10/1/16. Sony has gone to an Apple-style multi-tier announcement/order/release cycle, and today is the first day photographers can pre-order some of their latest gear. A total of seven items are available for pre-order at B&H Photo, including the 70-200mm f2.8 FE GM OSS for $2600 and the 50mm f1.4 ZA FE T* for $1500. Also part of the seven are two teleconverters (1.4x, 2x), two wireless radios, and a multi-terminal cable. These are estimated to ship late July 2016. As of 6/21/16 PM re-check, this is currently out of stock… It’s an in-stock party, the Sony FE 24-70mm f2.8 GM lens is now in-stock and ready to ship for $2198 with free expedited shipping from B&H Photo. The PZ version of the Sony 18-200mm f3.5-6.3 OSS E-Mount lens is bundled with a $50 Adorama gift certificate and a 67mm digital essentials filter kit from ProOptic, along with a handful of other free accessories (lens case, tether, pen, cleaning kit) for the same price as other authorized dealers of $748 with free shipping at Adorama. The Sony 18-200mm f3.5-6.3 OSS E-Mount lens is bundled with a $50 Adorama gift certificate and a 62mm digital essentials filter kit from ProOptic, along with a handful of other free accessories (pouch, tether, wrap, pen, cleaning kit) for the same price as other authorized dealers of $748 with free shipping at Adorama. This is the black color scheme, the non-PZ version of the lens. The PZ goes for four figures. NOTE!!! : this is a YMMV promotion. I have no way of knowing how many people are eligible. If you have an Amazon Chase VISA credit card and you are eligible for this promotion (detailed post explains the promotion ~ I don’t want to repeat the whole post) and logged on to your eligible Amazon account, there is a super hot deal [you will only see the offer if you are eligible] for the Sony 70-200mm f2.8 (SAL70200G2) [this is the lens page, everyone will see this]. The standard price for this lens is $3000. You add the Sony 70-200mm f2.8 (SAL70200G2) to your shopping cart, make sure your payment method is the Amazon Chase VISA credit card, and enter coupon code ARC20SPRING there. The price will drop by 20% in the right sidebar of the Amazon Checkout page, making it $2400 (rounded) with free shipping. This has to be sold and shipped by Amazon itself, not 3rd-party sellers. If it doesn’t, it means the promotion is not working, either because you are not eligible or you are using a different payment method or Amazon is not the actual seller or for other reason(s) that I am not aware of. Again, please note this is a YMMV type of an offer, I have no way of testing this at a grand scale. I tested with an account with the Chase VISA card, one without it, and not being logged on to Amazon. IF you tried this and it worked or didn’t please let us know in the comments! For more in-stock action (it looks a very busy month), check the In-Stock Alerts here at this blog (there’s also a menu option up top in the blue bar), and also the Jon Snow resurrection of the Stock Status Tracker. Choices are nice to have! If you are interested in the Sony Vario-Tessar T* FE 16-35 F4 ZA OSS lens, aka the SEL1635Z, there are two offers running, one authorized USA dealer, one imported at a lower price with a seller’s warranty. The authorized dealer promotion is the lens for $1250 with a $100 Adorama Gift Certificate included at Adorama. On the other hand, if you are comfortable with imported grey-market lenses that are covered by a seller’s warranty (instead of a Sony USA warranty), to the eBay Deals we go, where frequent grey-market eBay seller Get It Digital (99.4%) is offering the new condition imported grey-market lens for $1000 with a 1-year warranty from the seller. Another round of manufacturer initiated instant savings promotion (the main form of discounting current prices in the MAP era) is out, this time featuring various Sony Alpha lenses (both DSLR and mirrorless), and you can see them all nicely organized at B&H Photo. This is an “ever scrolling” type of a page, keep clicking the orange “Load More” button to see more options.